Almost sounds too obvious but the steering wheel lock isn't 'tight' is it? Also, wiggle the trans lever, if you haven't done so. There's a linkage (on mine) on the column about where the cluster is, and I've had mine come off before. You might have to drop the column a little to see it. On mine, it 'pops' back on place with a little snap. You might be able to see it right about below the speedometer ...but on the top of the column. Steering is not tight and I have wiggled the trans lever. Even disabled the safety and shifted to neutral. I will try to drop the column and see if I can see anything with the linkage. Before you drop the column, you might want to check the rod that goes to the actual ingition switch on the steering column. Unbolt the switch and see if the rod is loose and key cyl moves freely. If not then check the interlock rod which is on top of the steering column. The shift interlock is the rod that goes on top of the column and connects to a rod (with a ball on the end) behind the gauge bezel. You can see it if you remove the front gauge bezel (the plastic face). Check both. There's a metal bracket on top of the column by the ign switch that holds the shift cable ...it may be adjustable. If after removing the actual electrical ignition switch ..and the key cyl still doesn't turn, then it's probably the rack and gear inside the column itself. They're pot metal and do wear out/break ..but not commonly. I've replaced a few. See below for an example of what it looks like. Getting at it is some work, but just takes some time. I would recommend a lockplate removal tool and of course you NEED a steering wheel puller. The lock plate removal tool ..you'll thank yourself if you buy one. Otherwise, it's a LOT of work to remove that pesky circlip on the steering shaft w/o it. I think H/F has these..
Last edited by Jeepwalker; 02-11-2019 at 01:24 PM. I currently have the steering wheel, signal switch unit, and lock plate off. That is how I removed the key lock cylinder and saw that it turned freely. I did not see how to get at anything else from there though. The actual electrical switch is on top the steering column under the dash. You have to get under the dash to look at it. It's hard to see or get to b/c it's on the top side. Might have to remove the lower dash knee cover (which means removing the gauge cluster bezel first) to get at it. There gear and rack assembly is behind the key cylinder and that toothed 'rack' pushes (or does it pull??) a rod down when you turn the key. The rod is on the topside of the steering column and goes further down, about 1/2 way to an electrical switch and moves the springloaded switch when you attempt to start the car. If that switch is broken internally, or the rack/gear broken, then it won't move like it should ..and the key won't turn. But maybe since you already have the column part way disassembled, it might make sense to remove things a little further and verify it's all good in there, since you're there, and check the rack and gear and lube up if they're good. There should be some large screws or like 5/16" bolts visible to remove and the top part should slide up. 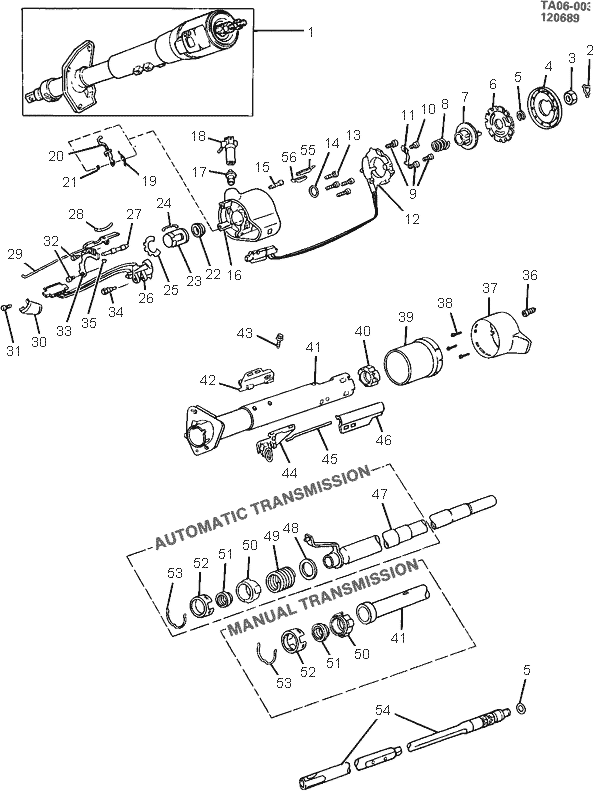 Download a digram of the steering column. Like I said, it's basically an 80's GM steering column. Make sure you get the diagram of either a tilt or non-tilt whatever yours is. Look at the image below, the rod is 29, the switch is 42. I just grabbed that image as an example. Not sure if it's like yours, but it should be similar. 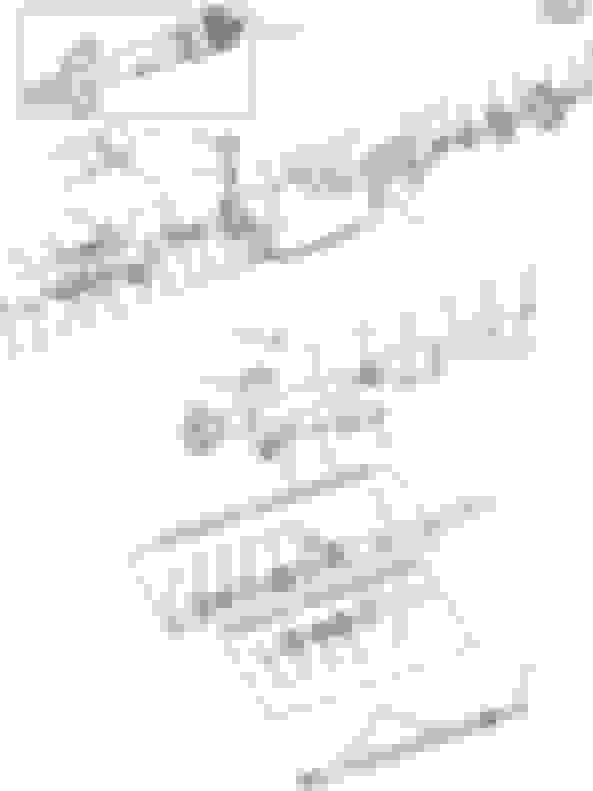 Last edited by Jeepwalker; 02-11-2019 at 02:46 PM. Jeepwalker thank you for all the help so far. Unfortunately I am working on this in my driveway so I can only do a little before it is too dark and cold in the evening. I pulled the gauge cluster out and looked at the rods. It looks like maybe the lower rod is not moving in the switch on top of the steering column. Is there something electrical that should release to allow it to move or is it mechanical and if it does not move it is a bad switch? No problem. The rod that goes to the switch, you'd have to push/pull it firmly. If it's not, the switch is could be damaged inside and seized. Take the switch off and if the key moves that was it. If not, probably need to dig into the steering column. The problem with the key not turning was the ignition switch on top of the steering column. It was locked up would not allow the ignition switch rod to move. When I removed the terminal with a purple wire showed burn marks. I installed a new module tonight. Key now turns but no start/crank. Acc works. When key is turned fully forward I get red brake and check engine light. Any ideas out there?